APSecretary of State John Kerry. 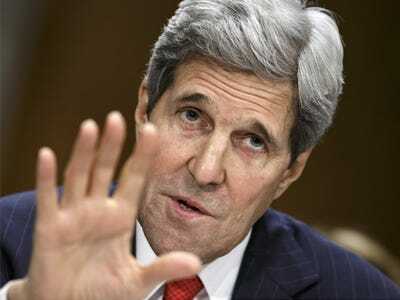 Secretary of State John Kerry said on Monday that carving out a nuclear deal with Iran simply takes a lot of time, as he explained why the talks blew past yet another deadline that very day. Kerry was speaking in Vienna, Austria, where negotiators had been working on a “a frenetic six days of diplomacy,” according to the Associated Press. The US and other international powers have imposed biting sanctions against Iran to pressure the country to curtail its nuclear program. They accuse Iran of seeking to develop nuclear weapons while Iran insists its efforts are for strictly peaceful purposes. After missing a previous deadline for a deal, negotiators agreed last July to reach a final agreement by Monday. However, diplomats revealed earlier in the day that the deadline would not be met and would instead be extended to the following July. However, Kerry refused to give any details on the potential agreement between the US and Iran. “If facts are out there being bandied back and forth in the public game with specificity, they can often end up defeating good ideas before they can get off the ground. So we need to continue working the way we have been: exclusively among the negotiators with respect to the details,” he said. Pushing back against critics, Kerry said negotiators have already achieved “real and substantial progress” with Iran. Many members of Congress have been sceptical of the negotiations and have argued that even more sanctions should be imposed if the process fails.